Intelligently designed on behalf of the Korea Ministry of Education, the Rocky Mountain Educators (RME) program is set in the Rocky Mountains of the western United States. RME is for the benefit of educating and enriching the lives of top educators through immersive learning. This unique 6-week program is built upon 4 main elements—1) Intensive English Instruction and Practice, 2) American Culture and Rocky Mountain Activities, 3) “Bucket List” Excursions, and 4) University Campus Living or American Homestay. Individual and small group English instruction taught by advanced degree and teaching certificate holders. Five hours each weekday receiving instruction in all aspects of English with a focus on conversation, writing, and context. Daily practical application practice for each topic. Enjoy life as it is lived in the beautiful Rocky Mountains, including fishing, horseback riding, hiking, kayaking, etc. Learn the history of the area and immerse yourself in the local businesses, restaurants, attractions, and culture. Excursions to Yellowstone National Park, Arches National Park, Goblin Valley, Olympic Park, and many other locations that you will remember forever (and brag about to your friends!). 1) Campus living at Utah State University: Experience campus life while lodging on campus at Utah State University. Explore the campus and enjoy all campus amenities, including the all-you-care-to-eat options. 2) Homestay with an American Family. Enjoy life as part of a local family. Become fluent NOW! Participants receive 5+ hours of our intensive English language instruction and practice each day. Learn in the classroom and practice in the community through specific and proscribed activities. Study hard, but play harder. Experience life on the frontier of the Wild West. Horesback riding, kayaking, rock climbing, fishing, rifle and shotgun shooting, water skiing, etc., etc. , and etc. Bear Lake and Tony Grove are fantastic day trips. Additionally, participants tour cultural heritage sites and private tours of unique local businesses central to the culture, including a chocolate factory, a creamery (ice cream! ), cheese production facility, dairy farm, a theater and opera center, a child development lab, and Utah State University. Parades and Fireworks highlight the National Independence Day (July 4th) and Statehood (July 24th)! These experiences equip participants to return home with a wealth of new perspectives to draw upon in their own classroom instruction with their students back home. Participants enjoy a 2-day guided tour through each of the incredible, once-in-a-lifetime destinations of Yellowstone National Park and Arches National Park. While Yellowstone and Arches produces incredible Instagram fodder and bragging rights back home, it might be the hike through the narrow slot canyon of Little Wild Horse Canyon, the Timpanogos Cave, or star gazing at the martian-like Goblin State Park (Dark Sky Certified!) that participants talk about most. Most participants enjoy living on the Utah State University campus. 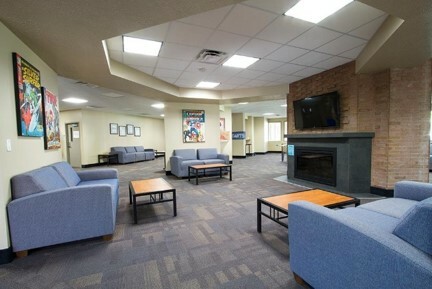 Campus life is vibrant with many convenient amenities, such as a library, movie theater, bookstore, recreational center, and all-you-care-to-eat meal plans. Jones Hall and Davis Hall provide comfortable living spaces. Click here to view a detailed daily itinerary of the 6-week Rocky Mountain Educator program. Click here for a one-page brochure. Click here for a detailed overview of the program. Apply before March 15th for an Early Bird Discount!